With Christmas coming up, I bet you have already put your Christmas tree up. However, if you’re like me and a little late in putting up the tree and decorations this year, then the question of whether to buy a fake or real tree might be crossing your mind. Before you go out and buy one, here are a couple of things you might want to consider. Biodegradable – It will naturally decompose and not use up space in landfill. Recyclable – After being used as a Christmas tree, it can be used for wood chips, mulch, or compost. Carbon Dioxide – These trees trap a greater amount of CO2 than normal trees. Aroma – It gives off a great pine aroma. Replantable – If your tree wasn’t a cut tree, it can be replanted after the holiday and used again next year. Organic – It can be difficult to find a truly organic tree; one that isn’t full of pesticides and chemicals. Transport – The tree might have been shipped across the country which uses gas and causes pollution. Watering – It can be a daily battle to ensure that a live Christmas tree always has enough water. Recycle – Some cities have Christmas tree recycling programs and some do not. 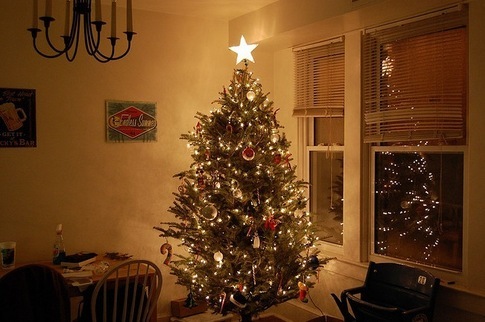 Reused – As long as you store it correctly, an artificial tree can be used year after year. Less Expensive – Since these trees are usually used for many years, they are by far cheaper — especially in the long run. Less Hassle – After putting up the tree, the work is done. It doesn’t require the constant watering and checking to see if it’s still alive. Less Mess – It doesn’t shed pine needles and make a mess on your floor. It can also be put up earlier, allowing you more time to appreciate it. Non-Biodegradable – Being artificial, it is made of things that are not biodegradable — such as plastic, metal, and lead. Overseas – As the saying goes, “Everything is made in China.” As a result, the transportation of artificial Christmas trees results in increased pollution. Storage – Since it does last year to year, you must make sure that you have the room to store it properly, so it doesn’t break requiring you to buy another one. No Aroma – It produces no pine aroma. Hopefully, these nuggets of tree Christmas knowledge will help you decide which is better for you. Neither is right or wrong, it just depends which works for your space, money, etc. If you do choose to buy a living tree, try to find a tree farm near you and make it a family event. My family and I have many fond memories of trips to the Christmas tree farm and cutting the tree down and dragging it back. Also, try to find a tree farm that does not use pesticides. Now it’s time to hear from you. Have you used a live or artificial tree in the past, maybe even both. If so, which did you prefer and what made it right for you?